Appearance: Dark chocolate with a mildly frothy tan head. Nose: Sweet, cereal milk, milk chocolate. On the palate: Full-bodied, bitter at first, then sweeter. Café mocha, vanilla and amaretto, with a bit of bite from the alcohol and carbonation. Finish: Sweet and pleasantly sticky fading very slowly to a smoky bitterness. The sticky sweetness continues to linger on the lips for a long time. Parting words: This is a delicious beer. 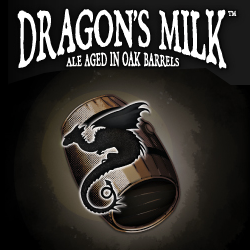 Unlike some other barrel-aged beers, Dragon’s Milk strikes a balance between barrel character and beer character. This is a quality stout first. Instead of being covered up, those stout characteristics are complemented by the wood tannins and the sweet vanilla and liquer flavors coming from the barrel. Dragon’s Milk is a flawlessly executed barrel-aged stout. Highly recommended.